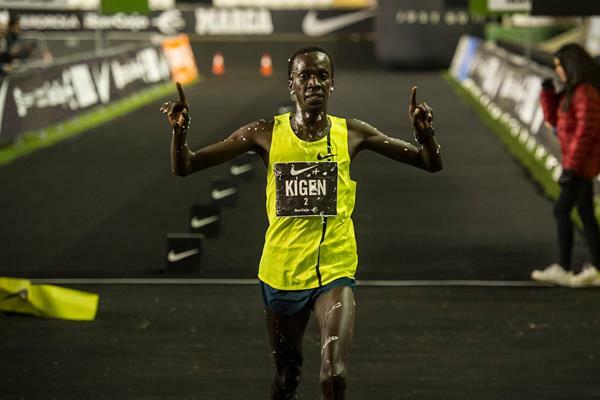 2006 Africa 10,000m and 5,000m silver medalist Mike Kigen has turned his back on motherland and has joined the growing list of Kenyans running for Asian nations. Kigen, 29, will now compete for Turkey as Kaan Kigen Ozbilen. His last major international competition was last October where he finished 3rd at the Amsterdam marathon won by Kenyan Bernard Kipyego. His time at the Amsterdam marathon was a Turkish record of 2:07:45 after setting a season’s best of 1:00:10 at the Great North Run the previous month. He ran at the Tuskys cross country in November in Eldoret where he finished 15th. Before then he had raced as a Kenyan at the Frankfurt marathon in 2014 meaning he may have applied and acquired his new citizenship the same year but was eligible to compete from October 1, 2015. He was out of competition for most of the season which makes him eligible to compete for Turkey a year later following an agreement between Athletics Kenya and Turkish Athletics. Both countries allow dual citizenship. He is set to run in the New Year’s eve at Madrid’s San Sylvestre Valelecana 10km an IAAF silver Label Road race in the Spaniard capital Madrid. He is also listed to compete in the the Xiamen Marathon two days later in China. According to the IAAF Ozbilen is expected to provide a healthy competition as he seeks to defend his title he won last year. It is expected to be a three-horse battle in the guise Ozbilen and two of the world’s best steeplechasers: four-time world champion Ezekiel Kemboi of Kenya and US record-holder Evan Jager. Ozbilen will have to contend with the superior speed of Kemboi and Jager on a fast circuit like Madrid. While the 33-year-old Kemboi boasts a relatively modest 10km PB of 28:38, the long-legged Jager has not a registered mark for the distance. He does, however, own a 5000m PB of 13:02.40 and earlier this year clocked a 1500m PB of 3:32.97. Ozbilen, confirmed to Sports News Arena that he will be competing at the 31st race but he declined to answer the any questions on his citizenship switch. He will be joining compatriots Ilham Tanui Özbilen, the middle distance runner formerly William Tanui who made the switch in 2011 and Ali Kaya who was Stanley Kiprotich(5,000 and 10000/0 before he moved to Turkey in 2010. His former coach Sammy Rono at Pace training camp based in Kaptagat was suprized by the switch. “I really didn’t know that he left Kenya but right now am a national coach so I don’t deal with him one on one,” said Rono.